June | 2010 | Baking and Caking! After almost a month in our apartment uptown, my roommate and I decided that it was time far an all out dinner party. Yes, we’ve obviously made very nice dinners for each other before, but this time we decided to invite over some friends and have many dishes to share. Our planning started weeks ago when we decided that at some point we were going to make gnocchi and all of the other dishes fell into place, as the day got closer. It was quite the extravaganza. I didn’t get home from work until 6 and my friend Emily and her brother were already there. 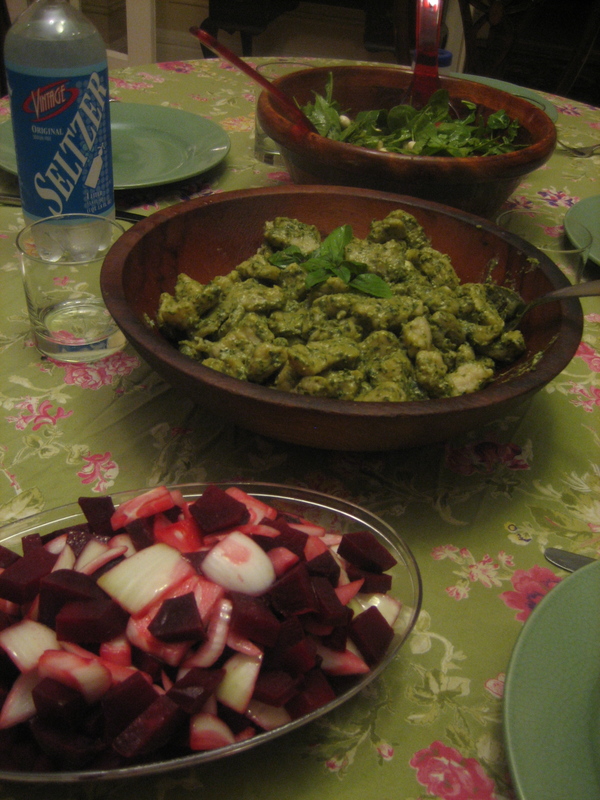 Thank goodness I had made the dessert in the morning, because once I got home it was a whirlwind of cooking as we made pesto, gnocchi, pickled beet salad, and a caprese salad. 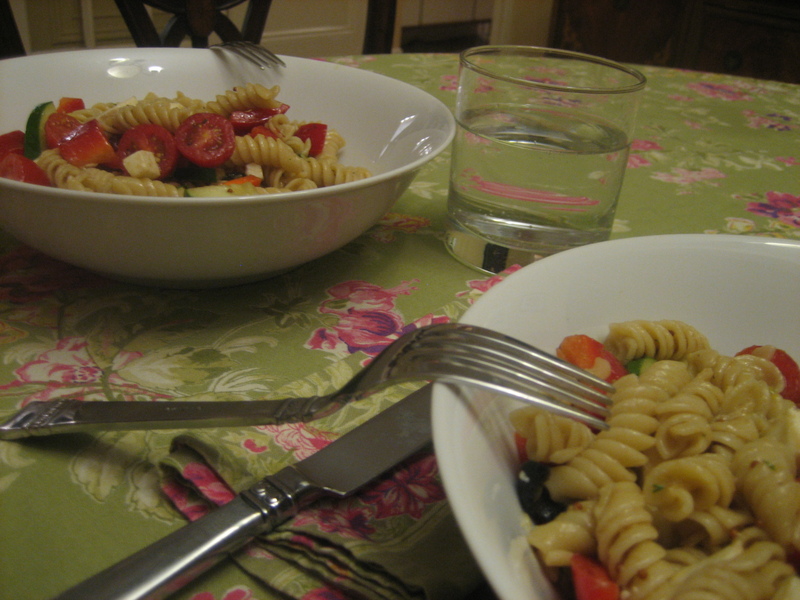 While the kitchen turned into a war zone, the meal came out perfectly. Each dish came out just as we had planned and while the gnocchi was a little more difficult then we had planned, it still worked. For future reference, I would leave lots of time to make a big pot of gnocchi. While slipping them into the water right before the meal was perfect because they really take all of 90 seconds to cook – boiling the potatoes, mashing them, and rolling out the dough takes some time and patience. Investing in a decent potato ricer is advised as well, given that our mixer turned the potatoes into mashed potatoes, making our dough very wet and sticky. Using my dad’s pesto recipe though, which is really one of the easiest things to make, they came out just fine! 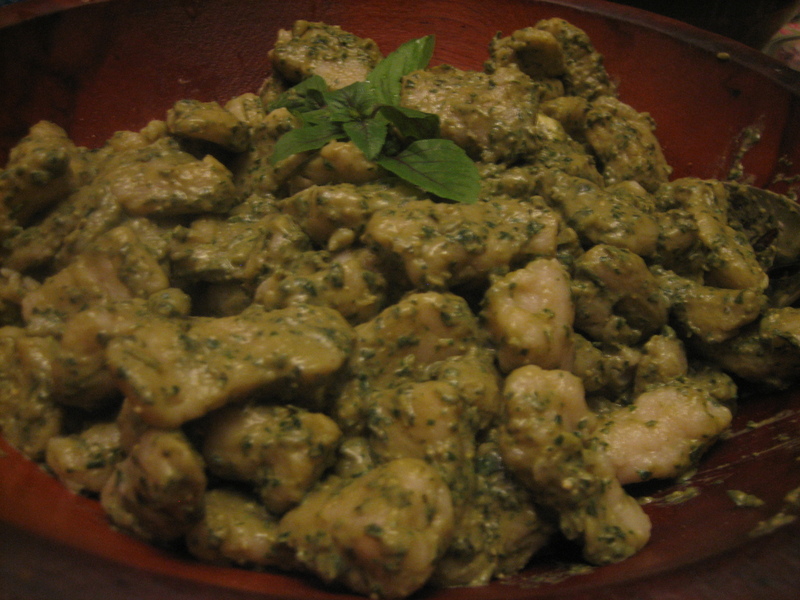 2) Slowly add basil leaves, blending to smooth paste. 3) Add garlic, salt and pepper to taste. 1) Boil the whole potatoes until they are soft (about 45 minutes). While still warm, peel and pass through vegetable mill onto clean pasta board. 2) Set 6 quarts of water to boil in a large spaghetti pot. Set up ice bath with 6 cups ice and 6 cups water near boiling water. 3) Make well in center of potatoes and sprinkle all over with flour, using all the flour. Place egg and salt in center of well and using a fork, stir into flour and potatoes, just like making normal pasta. Once egg is mixed in, bring dough together, kneading gently until a ball is formed. Knead gently another 4 minutes until ball is dry to touch. 4) Roll baseball-sized ball of dough into 3/4-inch diameter dowels and cut dowels into 1-inch long pieces. Flick pieces off of fork or concave side of cheese grater until dowel is finished. Drop these pieces into boiling water and cook until they float (about 1 minute). Meanwhile, continue with remaining dough, forming dowels, cutting into 1-inch pieces and flicking off of fork. As gnocchi float to top of boiling water, remove them to ice bath. Continue until all have been cooled off. Let sit several minutes in bath and drain from ice and water. Toss with 1/2 cup canola oil and store covered in fridge up to 48 hours until read to serve. Rice Krispie cereal is one of those cereals that never gets old. Although I don’t buy it too often, I always enjoy eating in whenever I get the chance. The same holds true for rice krispie treats, which makes this timeless cereal that much better by adding a whole bag of melted marshmallows. Clearly, the only way to make this treat any better would be to add possibly my favorite ingredient of all time – coconut. In my opinion, coconut should really go in every dessert treat, but I do understand that sometimes it just doesn’t fit and I restrain myself from adding it to everything. 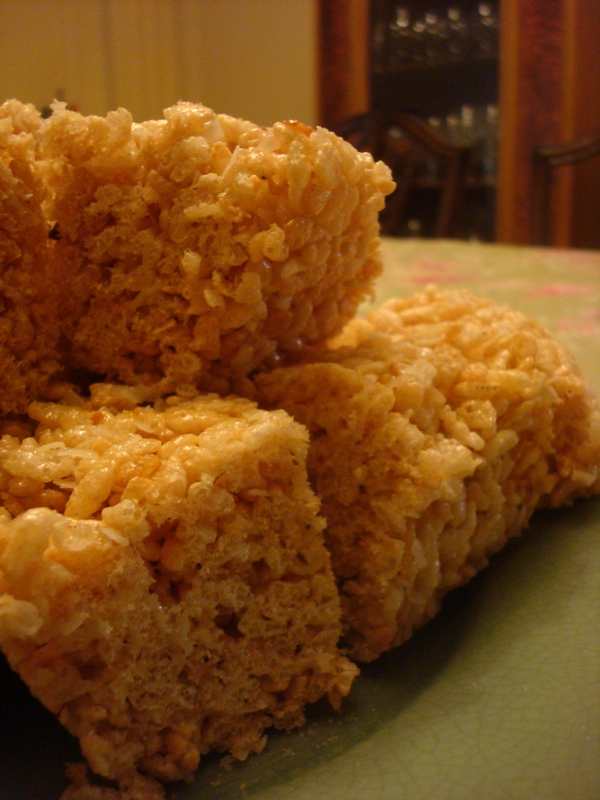 For rice krispie treats though, the more coconut, the better. I lightly toasted the coconut for a few minutes in the oven first before I added it to the rice krispie and marshmallow mixture. Keep on eye on the roasting coconut though, as it can tend to burn quickly. The toasted coconut brings out the aroma and nuttiness of it of the shreds in my opinion. This is such a simple and easy treat to whip up. It’s light for just a sweet snack and had I had the time to drizzle chocolate over it, it would have made an excellent dinner dessert. 1) Line a 9×13 inch pan or baking dish with foil, leaving a few inches of overhang on each side. Grease the foil very well with cooking spray. 2) In a large saucepan or pot, melt butter. Add marshmallows and heat over medium-low heat, stirring until melted. Stir in shredded coconut and coconut extract. Remove from heat. Add Rice Krispies and stir until thoroughly coated. 3) Spread Rice Krispie mixture into prepared pan. With the back of a buttered spatula or using a sheet of waxed paper, press mixture firmly into an even layer. Sprinkle with toasted coconut and press lightly to adhere to the top of the treats. 4) In a small, heatproof and microwave safe bowl, heat the chocolate in the microwave on high for 30 seconds. Stir, and return to microwave, heating in 15 second intervals and stirring well between each heating, until chocolate is melted. Drizzle melted chocolate over the treats in the pan. 5) Cool at room temperature until chocolate hardens. Once cool, lift treats out by the edges of the foil. Cut into squares and enjoy feeling like a kid again. Recently, my roommate and I have been planning rather elaborate dinners for each other. Last week we had salmon tartar and mushroom quiche, which was delicious. The other night, we made a seasonal pasta salad and last night we made lasagna rolls. The lasagna was a momentous occasion given that I had bought the lasagna noodles ages ago and we’d always spoken of making it, but never had until last night. I had bought the noodles so long ago that I remember wanting to make pumpkin lasagna with them and I haven’t made anything pumpkin since last fall. I guess it’s a good thing that pasta doesn’t go bad. I’m not quite sure why we didn’t make more fancy meals like this in our dorm this past year, but I guess it’s a bit easier to cook for two people rather than six. Also, we have a nice big kitchen with a proper stove and oven that makes everything sail a little smoother when baking. We made a huge bowl of picnic-perfect pasta salad last week, and a few nights ago Charlotte went all out and made mushroom quiche and salmon tartar. It’s so much fun to have someone else who loves to cook living with you. While lasagna can be a little time consuming, especially if you plan on making your own sauce, it’s completely worth it. We didn’t finish it all in one night and it is definitely a dish that can be easily reheated and served again the next day. 1) With some olive oil, saute chopped onions over medium heat until translucent. Add crushed garlic cloves. 2) Pour in tomato puree and lower heat to low. Add salt, pepper and any other dried or fresh herbs you’d like. I added some basil, italian herb mix, and oregeno. 3) Let tomato sauce simmer for 10 to 15 minutes over low heat. Remove from heat when finished. 1) Prepare noodles according to package. 2) In a large mixing bowl, mix ricotta and dried spinach. 3) Spread 1 to 1 1/2 cups tomato sauce at the bottom of a casserole dish. 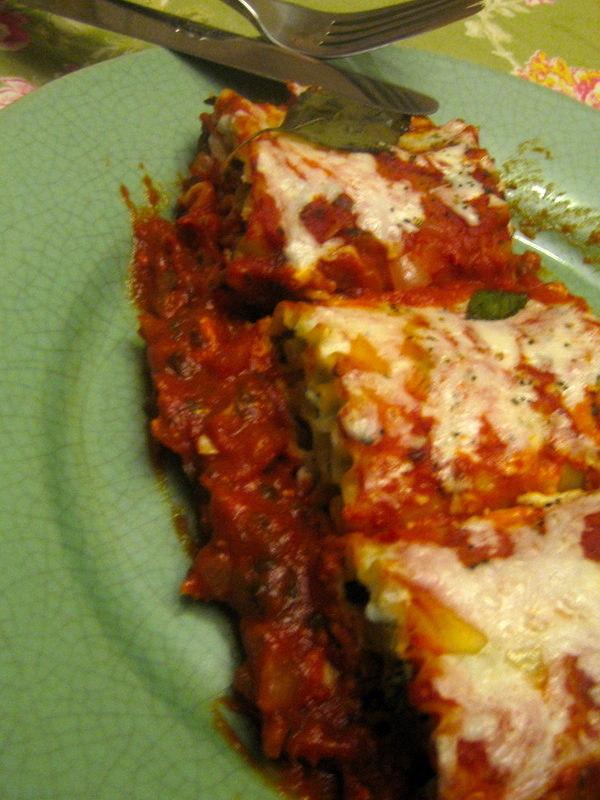 4) Using your fingers or spoon, take 1 to 2 tablespoons of the ricotta mixture and spread across a lasagna noodle. Roll the noodle up and place seem side down into your prepared casserole dish. Repeat until you are out of cheese of our of noodles. 4) Pour remainder of tomato sauce over top of the rolls. Grate as much or as little mozerrealla cheese over the top and garnish with some fresh basil leave. Wrap tighttly with tin foil. 5) Bake covered for 20 minutes in a preheated oven at 350 F degrees. Remove tin foil and bake for another 10 to 15 minutes.